Applicable for glass or acrylic aquariums up to1.25 in. 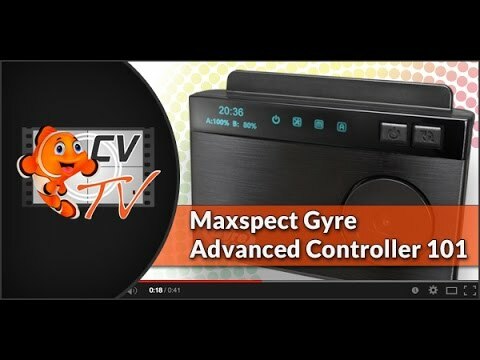 The Maxspect Gyre is the world's first "gyre"- generating water moving device for aquariums. Compared to traditional powerheads and wavemakers that are based on propeller nozzle flow technology, the Maxspect Gyre is based on advanced crossflow technology which produces massive horizontal water movement leaving little to no deadspots in its wake. Dimensions (LxWxH): 14.8" x 3.8" x 2"
Gyre Pump with Magnet Mount, Advanced Controller with mount, Power Supply, Spare Rotors, Snail Screens and Cages. *Specifications are subject to change without notice. Weight and dimensions are approximate. IC-GEL Insta-Cure Coral Glue, Cyanoacrelate Gel 20gr.